Trenton TSB7053 Xeon processor card - other options available 8 DNK7_F5PCIe Kintex 7 FPGA cards with 5 7K410T-1 FPGAs per card. 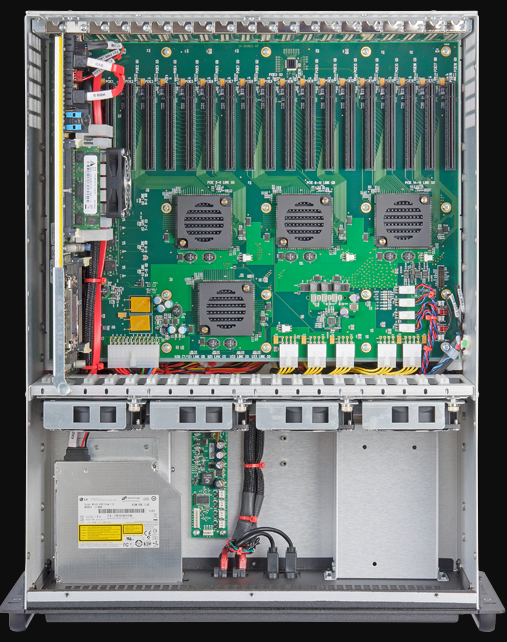 This system contains the maximum number of cost-effective FPGAs that can be reasonably integrated into a 5U chassis. Power and cooling are the constraining variables. High-performance data paths between FPGA boards enable data movement under algorithmic control that is wholly separate from the host processor, enabling FPGA-based acceleration of whole new classes of data-intensive algorithms. 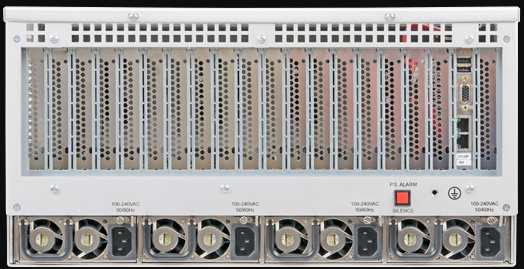 In short, the DNK7_F5_8_Cluster is a massive number of large, low-cost FPGAs integrated with an excellent single/dual Xeon-based processor host. Central to the DNK7_F5_8_Cluster is the TrentonTSB7053 host processor card (other boards may be substituted). This single-board computer has an Intel Xeon processors, clocked at 3.4GHz. The processor has 4 DIMM slots that can be stuffed with up to 32GB DDR3 RAM, max 8GB of memory per slot. The processor card has two 10/100/1000 Base-T Ethernet ports, along with 4, USB2.0 ports. The chassis can host up to 2 SATA drives. Power and cooling are provided for up to 8 DNK7_F5PCIe cards. Power is cabled to the FPGA cards separately and not drawn from the motherboard, allowing us to exceed the 25W slot PCIe limitation. The power budget is TBDW per board. Note that this requires a lot of airflow and the fans are noisy. Fully populated, the system is perhaps too noisy to be in close quarters with an engineer. The DNK7_F5PCIe is Xilinx Kintex-7 based FPGA board optimized for algorithmic acceleration applications requiring FPGAs with high performance local memory. Data movement to/from the FPGA grid is accomplished via a fixed 4-lane, GEN1/GEN2 PCIe bridge. Each field Kintex-7 FPGA (FPGAs 1-4 in the block diagram) has five separate 256M x 16 DDR3 (4 Gb) memories. The Dataflow Manager FPGA (FPGA 0 in the block diagram) has six 256M x 16 DDR3 memories. The DNK7_F5_8_Cluster can host 8 of these cards. 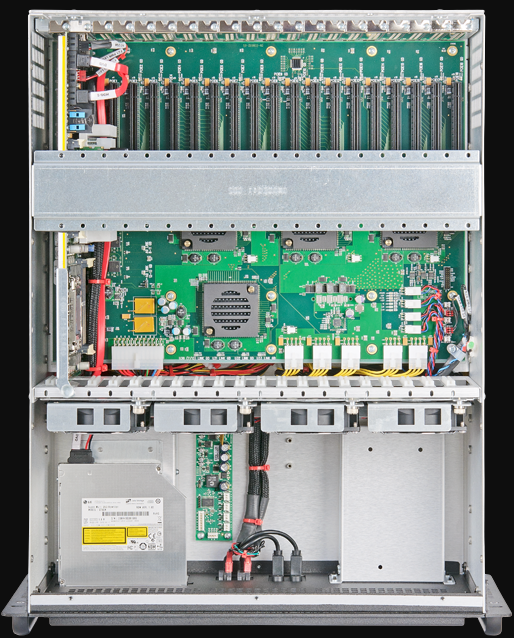 We use the largest device from this family, the 7K410T, in the FFG900 and FFG676 packages. 100% of the FPGA resources are dedicated to your application. All FPGAs, excluding the PCIe controller, are configured via PCIe. The PCIe FPGA can be updated in the field. As always, we provide examples and references designs to help you with all of your memory interface issues. Please check with us to make sure that what we ship for no charge meets your requirements. The PCI Express specification limits slot power to 25 watts. The DNK7_F5PCIe is capable of consuming power significantly beyond that. In addition to the PCIe fingers, a separate connector adds a second path for power. This product is shipped with adequate heat sinks to consume TBD watts, but airflow is required in the chassis to dissipate the heat. Contact the factory if you require high reliability, no-fan heatsinks. Although no specific testing was performed, sophisticated statistical finite element models and back of the envelope calculations are showing the number of status LEDs to be bright enough to work as a flashlight. These LEDs are user controllable from the FPGAs so can be used as visual feedback in addition to emergency lighting. A JTAG connector provides an interface to ChipScope and other third party debug tools.